Cheeky Parade is a 9-piece idol group produced as the second idol group from aves’s idol label, “iDOL STREET”. The group is named under the concept of a fun entertainment imagery such as cheeky girls marching in a parade. They made a major label debut on January 9th with the first single “BUN BUN NINE9’”, rising the chart to top 4 in ORICON WEEKLY RANKING. The second single “C.P.U! ?” went up to the fifth and the third single “Mugenshojo∀” to the fourth , releasing three consecutive Top5 chart toppers. 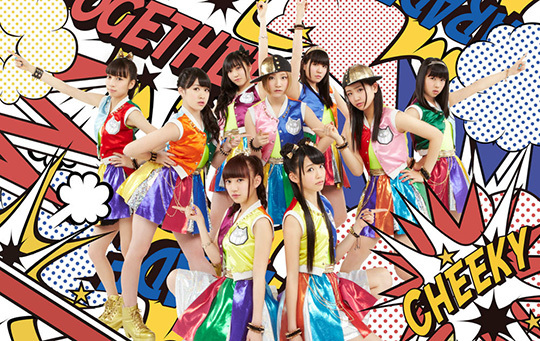 The highly anticipated first album “Cheeky Parade Ⅰ” is to be released on November 27th. They perform under the concept of “the Space” and trying to make it to the top of the idol world, pursuing their own musicality.